“I always enjoyed the beautiful stained glass windows at Kingston Presbyterian Church,” says Parker, “ and as a kid, I really liked going to the Carnegie Library to see the refracted light through the entry door bevel windows; the corridor walls and floor had all the ‘rainbows’!” In the early '80's Parker took a stained glass class at the Y and worked at it for several years. But teaching school and raising his sons put his stained glass hobby on the back burner until about about eight years ago when he dug out the old glass and tools and started again. 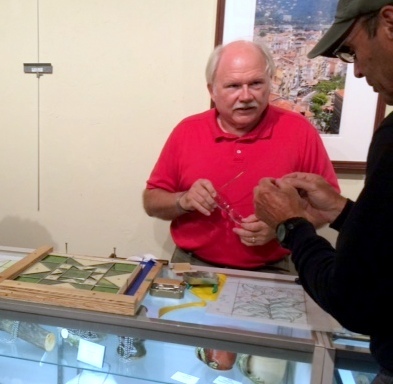 He has taken classes at North Vernon (Classic Stained Glass) trying to improve his skills. “I've made panels for the grand children, our kitchen cabinets, and drive my wife Margaret frazzled by having most of our house windows decorated with a panel, or two!” Parker added. Edward Parker has lived in the Greensburg/Kingston all his life except for going to Ball State University and three years in the Army when he was stationed in Alexandria, Virginia and Nürnberg, Germany. Now retired, he taught teaching mathematics at North Decatur High School starting in 1979. Edward’s wife of 40 years, Margaret, is a retired art teacher, having taught at Greensburg Elementary and Junior High. She is also an exhibiting artist at Art on the Square. The couple has two sons, William and Robert, two wonderful daughter-in-laws, Lori and Leslie, and five delightful grandchildren.